When you go cycling, the last thing you want to do is carry more weight than is necessary. But you can’t go out without a tire pump unless you really want to tempt fate. Floor pumps are easy to use and don’t take much time or power to fill up your tires, but they’re heavy. Portable mini pumps are lightweight and easy to carry, but they take a ridiculous amount of pumping to fill up a tire. 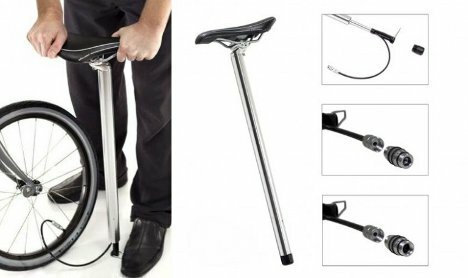 BioLogic came up with the perfect mix of the two with PostPump: a floor pump that fits inside your bike’s seat post. The PostPump was introduced several years ago, but now BioLogic has released PostPump 2.0, a redesigned version of the cool device. The new version features a reversible valve adapter that fits both major types of air valves. The PostPump 2.0 probably isn’t for serious racers due to the small amount of weight it adds to the bike, but for the rest of us it’s a welcome departure from those terribly annoying portable pumps.